Tinnitus is the medical term for the sensation of hearing sound in your ears when no external sound is present. 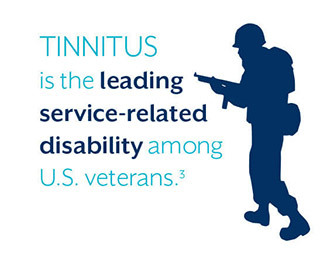 Tinnitus effects 50 million Americans (nearly one in six of us). Most sufferers describe the sound as "ringing in ears," though others describe it as hissing, buzzing, whistling, roaring and even chirping. For some, tinnitus is mild and an intermittent annoyance. For others, it's severe and can have a profound effect on their quality of life. 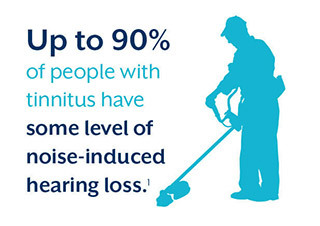 But for everyone, finding tinnitus relief is a high priority. Hearing conditions – Conditions such as otosclerosis and Ménière’s disease are known to cause tinnitus. Currently, there is no known tinnitus cure. But according to the American Tinnitus Association, there are recommended ways to get tinnitus relief, including counseling and sound therapy. 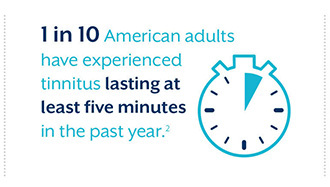 Starkey’s proven tinnitus products are an effective part of any sound therapy as they utilize a customizable and comforting sound stimulus that soothes the annoying noises associated with tinnitus and takes your mind off it. What should you do if you have tinnitus? Since the exact cause of tinnitus is not known, it’s recommended you visit a hearing healthcare professional for a clinical evaluation. Specialized tests are performed to diagnose tinnitus and different options can be discussed to find what is right for you.